Every time I sit down to write one of these, it’s like a wrestling match with myself. How much should I include? Should I try to hide the ugly bits? Obviously, I want things to seem as great as possible. Anyone writing about the progress of their company wants to paint a positive picture. Unfortunately, that’s not always reality. I’ve written before about the ups and downs we have faced—the ways we failed and what we hoped to learn moving forward. Today is about writing a similar post. Our first quarter has been good in some ways, but it has been a failure in other ways. After going a few rounds debating myself, I eventually remember the point of this entire thing. It’s transparency—it’s about honesty. So that’s here we are at. It’s the hard truth. In Q1 of 2018, our revenue was flat. We have hit our first plateau. And now we have to figure out how to fix it. This isn’t exactly what we were hoping for, of course. Our goal is still to 3x revenue in 2018. At this point in the year, we would need to be at around $60,000 MRR instead of our current revenue of about $40,000. We’re behind pace and need to play catch-up the rest of the year. But it certainly wasn’t for lack of trying. This last quarter was a frenzy of business development activity. We added more opportunities to our sales pipeline in the last quarter than we did in all of last year. 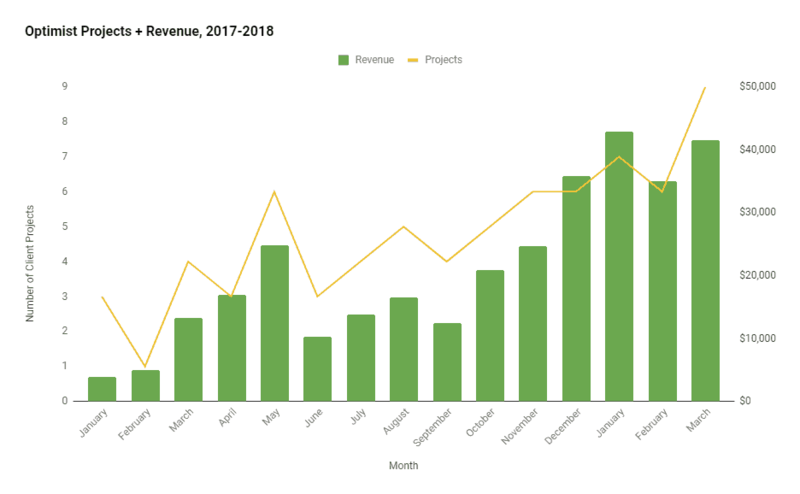 Even though we have been adding a ton of opportunities into our sales pipeline, we have struggled to convert those opportunities into revenue so far this year. The real question for me and our team is what is causing this plateau and how we can overcome it to start growing again. We need to fix it. My job for the coming months is to diagnose the problems that are making our sales process inefficient and then figure out how to fix them. Since this is our most pressing problem and one that I think faces a lot of agencies, I’m going to focus pretty much this entire post on our current thinking around sales, our problems, and our potential solutions. We have a 5-part plan for how to fix our agency sales process. When we first began Optimist, almost all of it leads came through the same few channels. They discovered us based on the College Raptor case study that we published. As such, pretty much every prospect was aligned with the same message and had the same context coming in—they wanted similar results for their business. So we developed our sales communication flow based on that expectation. But as we have grown, so has our library of content. And so have the different paths for prospective clients. People come through different content and channels. Our goal with reworking the sales communication process is to make sure that every prospect has the same expectations and understanding of our work. This means assuming nothing about the content they have read or the job they want Optimist to do for them. Although our primary focus is on converting opportunities into sales, there is something to be said about the quality and velocity of the inbound leads we can generate. We have made a lot of improvements to our inbound process over the last few months, but there are still ways to streamline it. Part of our goal here is not just to get more leads, but to get better leads. Improving the overall close rate for leads that enter into our funnel means we will spend less time/energy on biz dev to generate the same (or more) revenue. This goes back to our overall business philosophy and strategy. Our goal is always quality over quantity–we want fewer, better-qualified leads rather than more leads and lower conversion. With our prospects coming through a broader range of paths and journeys, it’s obvious that they do not all have the same context about what value we can provide. Many of the inquires that we get seem to be thinking of us as a service provider first, rather than a partner that can deliver growth. Our entire model is built on clients working with us in order to achieve growth and our value-based pricing reflects that we aren’t just a content mill. So, if prospects are comparing us on a price basis to other vendors, the deal is dead in the water. We can never compete on price—because we never try to. Instead, we need to lead every discussion with value. We need to cast a vision for what we can accomplish together and how it will help drive their business forward. If the discussion is about how we can help generate 7% WoW traffic growth, it’s clear that we are offering more than just blog posts. As a business owner and a team leader, a big part of my job is to recognize when things aren’t working and when we need to make a change. Many times, these are not easy or comfortable decisions. In this case, it means facing my own limitations. Secondly: I can’t manage all of our clients forever. As of now, I am the only account manager and I am juggling about 8 ongoing projects. This is close to my maximum capacity and I need to find help before any cracks start to show. So, we are growing the team. We are adding a new principal who will help carry the business development process and hopefully help us close more of the deals that are getting away from me. This can be a difficult leap for an agency. Especially when there is only one founder/owner. It means handing over some of the reigns to the thing you’ve built, not to mention cutting into the margins that flow from the business. Nevertheless, it’s a critical step. No service-based business can scale if everything has to flow through a single person. And my goal isn’t to work 100 hours a week, either. So that means it’s time to expand the team to get us to the next phase. As you can see, we are doing a lot to try to fix the problems with our sales process and keep our pipeline running smoothly. But, frankly, we’re just winging it. None of the Optimist team members have much real-world sales or operations experience. This is just our best guess at what we are doing wrong and what we can do better—but that doesn’t mean it’s right. So we’re bringing in some help. Much like how we brought in outside help to define and improve our marketing automation and nurturing process, we are also looking at a few different agencies to help us define our sales process, messaging, and communication. If nothing else, it’s usually beneficial just to have an outside perspective. But I think getting some expert help from someone with more experience than us will definitely help move the needle. Let’s take a look back at the goals we set for 2018 and where things currently stand. Obviously, the most disappointing thing so far this year has been our lack in revenue growth. We’ve been flat (pretty much) for about 3 months. Hopefully we will see more growth in the coming months. We may be slightly behind on this goal, but generally making pretty good progress. As I’ve focused more on biz dev and agency operations, this has been less of a concern. We are generating plenty of leads, so growing our footprint is less of a priority than doing the actual work right now. 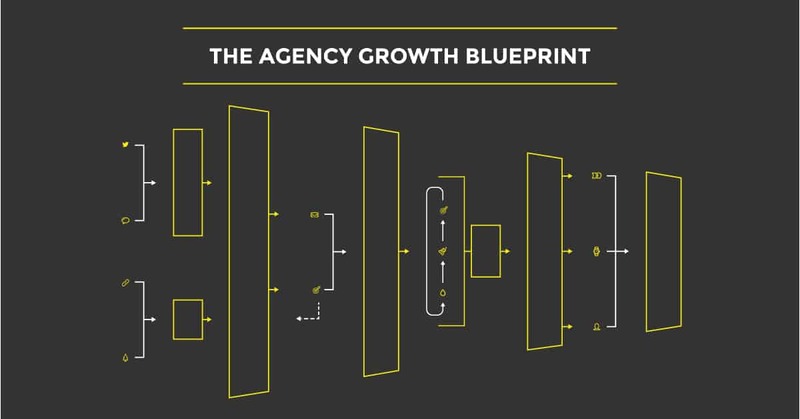 The Agency Growth Blueprint	was completed in Q1. I think it’s a great resource that shares some of the insights and strategy that we have used to generate leads over our first year. I presented as part of the Organic Traffic Conference earlier this year and also hosted a workshop at Galvanize in San Francisco. They asked me to host the same workshop in Denver–which is coming up next month. I’d like to put together a webinar series for later in the year to meet this goal. This just hasn’t been a priority so far in 2018. Still hoping to put something together, but it may be something simpler than the original vision for a course. As I mentioned originally, we are now focused on making quarterly donations of at least $2,500 to causes the team cares about. So far, we have supported organizations like SAME Cafe in Denver, Farm LA, Save Our Scruff, and Dress for Success. We’re actively looking for ways to get more involved in giving back and helping nonprofits meet their goals. I started writing this post nearly 2 months ago. It was the end of Q1 and I was feeling very defeated. After tons of work and opportunity, it seemed we were stuck—no new revenue in 3 months feels like a punch in the gut. So I sat on this post. I mulled over the best way to break the news. And, frankly, I was also just busy working on client projects. Now we are about halfway through Q2 and things are a lot different. We have an incredible amount of work in our pipeline. We have signed 3 new clients in the past 30 days. In fact, we are actively considering how we might slow down biz dev to avoid growing too quickly. That is a much better problem to have. I don’t want to steal all of the thunder from my official Q2 update. But, suffice it to say that we are on track to accomplish some pretty incredible things by mid-year. And after spending a lot of time mapping out the rest of 2018, it seems like we could make a pretty good run at our goal to hit $1.5mm ARR. As an agency owner, I think this has taught me that sometimes you just have a bad run—things don’t go well. And what’s important is learning to weather those down times long enough to make it to the good ones. When things get tough, try to remind yourself that the next high might be just around the corner. This also means insulating yourself—personally and mentally—from the fluctuations. If you take every bad day as a personal attack on your abilities, you’ll burn out quickly. You won’t have the energy left when things come back around. So, protect yourself. Remind yourself that it’s just the nature of the beast. Tomorrow could be the day that everything turns around. But you have to make it to tomorrow to find out. Sign up for updates from our agency journal. We’ll never send you spam or BS. I'm the strategy director at Optimist. I've spent nearly 10 years helping startups, agencies, and corporate clients achieve growth through strategic content marketing and SEO. Enter your email to receive a free copy of the Agency Growth Blueprint. This guide outlines the tactics and strategies that we've used to grow Optimist in year one.